If you could see me now, you'd see the droop in my shoulders. It wasn't the first time someone demeaned what I have been doing with my professional life for the last 25 years. She's a friend, and she really didn't mean to. We were talking about credentials and continuing education required in various professions. When I told her the amount of continuing education I must take to maintain the three credentials I've attained, she smiled and wondered aloud why I'd need continuing education to decide what color the flowers should be and where they should go. I smiled at her joke, and I cried a little inside. It wasn't a funny joke. But it does clarify an issue in our field — people don't know what interior design is. 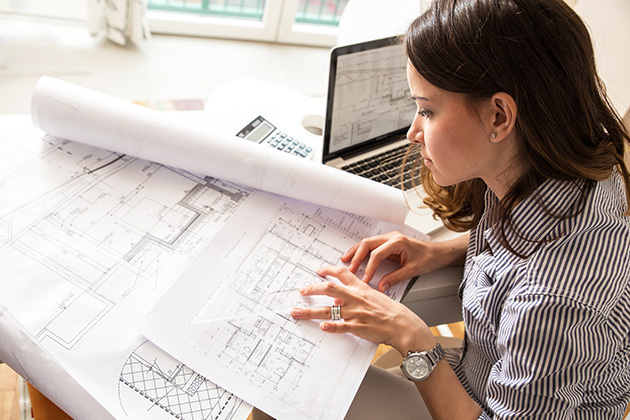 According to the California Council for Interior Design Certification: "An 'Interior Designer' is someone who can complete an interior design project from start to finish, including preparing construction documents for bidding and permitting, as well as supervising the construction and installation of the work. This person in essence becomes your agent to deal with local building codes and building departments, and licensed contractors. They have the expertise to handle all of these different players ..."
An interior designer works in the field of construction to create the built environment. We sign drawings like architects do, but the scope of our projects is limited to work that does not involve the structural components of a building (the parts of the building that support the roof). If structural components are involved, then a structural engineer must be engaged. If the exterior of the building (known as the core and shell) are involved in the project, then typically an architect will be engaged. On residential remodel projects, a skilled interior designer can usually handle the full scope of the project. Prior to building any construction project, documents must be created. Prior to creating these documents, a design must be completed. Programming: You will answer questions about the use of your space; what works and what doesn't; when the space is or will be used and how and by whom; what you want it to look, feel and sound like. We will talk about the function of your business and of other businesses like your business. I will take measurements and draw base plans. Schematic design and design development: I will layout the walls within your space, determine power and plumbing needs and locations, create designs for millwork and custom furnishings, design the overall look and feel of your space. I will coordinate the consultants we may need to engage for acoustics, lighting, art, architecture, graphics, etc. I will also engage fabricators to create specialty items. I will determine how the various codes will impact the space and begin a conversation with your local building and fire departments to affirm that we are designing to code. During these phases, I will present the design to you as it develops and refine it to meet your aesthetic and functional needs. Depending on the use of space, particularly with commercial projects, functional needs and code compliance will drive much of the layout. Permit documents, bid documents and construction documents: To communicate your design, I will create drawings and write specifications. The various consultants on the project will also create drawings for their specialties that either the architect (if there is one) or I will coordinate into a single unified set. Using these documents (which can number hundreds of pages), we will first apply for necessary permits. This process can take months to complete and will often include the submission of further documents to satisfy your local building/fire/health departments. Once permits are issued, and if this project will be bid, drawings and specifications may need further clarity and revision and will be issued to bidders to get final pricing for the project. Once bids are in and a contractor is chosen, documents will be issued for construction. Construction administration: During construction, I will visit your site regularly, get to know your contractor's superintendent well, answer questions as they arise, review items and finishes prior to installation, point out problems when something is not built to plan, keep you apprised of progress, approve your contractor's billings so you only pay for work that has been performed, and engage other members of the team as needed. Part of the job of an interior designer is to understand and have the ability and knowledge to research codes that are applicable to your project. When creating the design for your project, all of these codes must be addressed and complied with. Prior to applying for necessary permits, the requirements of these codes must be met in your permit documents. Building codes: These are codes that keep you and your employees and customers healthy and safe. We call these codes "life safety," and they include things like the width and length of corridors, exiting, fire sprinklers, the size of windows, emergency lighting. There are plumbing codes that specify how many toilets and lavatories your space must include and what type of fixtures are required. There are energy codes that limit the amount of wattage that is allowed for lighting and specify where motion sensors are required. There are local codes that can include just about anything and which I will research and discuss with your local building department as early in the project as possible. Health codes: Health codes address kitchens and restrooms in your commercial project. They also have requirements that must be met for tattoo parlors, swimming pools, medical facilities, water systems and multiunit housing. Accessibility codes: The federal ADA regulations include specific requirements that allow space to be utilized by people with various disabilities. These requirements are far-reaching and include things from parking lot ramps to the height of wall sconces in hallways and the size of toilet stalls. Many people out there call themselves interior designers. Some of them are decorators who choose colors, select furniture and drapery, or — like my friend said — locate your flower arrangements. An interior designer is credentialed in some way, has specific education and knowledge, and can do the work of a decorator and much more. Education: An interior designer receives education on everything discussed above. In addition, we learn about color, lighting, acoustics, three-dimensional space, art and architectural history, available and appropriate finishes and materials, and even furniture and millwork design. There are many accredited educational programs, from three years (post-graduate) to four or five years, that provide some type of degree. The program I completed was a five-year bachelor of science program. Different programs provide differing levels of education. If you are looking for an interior designer's qualifications, start with education but also look for advanced certifications. Certifications: As in most professional fields, there are many advanced certifications available to interior designers. The three I've attained are listed below, but there are others as well, particularly in the realm of sustainability. CID: In some states (as in California) the term "Certified Interior Designer" is codified in the Business and Professions Code and can only be utilized by interior designers who have taken the certification exam. These interior designers have specific education and have proven their knowledge of process and codes and their competency in applying this knowledge. LEED AP ID+C: The USGBC created the Leadership in Energy and Environmental Design accreditation program to credential leaders of sustainability in the built environment. The accreditation that I studied, tested for and practice is in interior design and construction. There are other "green building" programs as well as other accreditations within LEED. All indicate specific knowledge around sustainability. So, yes, an interior designer can help you choose flowers. And most designers, after years of study and practice, have a "good eye." But we also have extensive knowledge and experience that qualifies us for much more than that. I hope this clear things up just a bit. And don't worry, my feelings aren't really hurt.